Nice control with the watercolor! Really cute illustration. Ha,ha! Like the way those sheep look at her! Charming! Love her little petticoat! So sweet! Adorable! I lreally like the loose colorful playfulness of this. this is very sweet, it's a lovely idea, cheeky sheep! the styles really nice, it's free and energetic. great stuff! oh, this is darling! 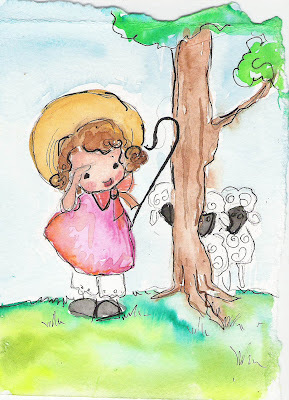 adorable little-bo-peep and sheep... love the simplicity of the sheeps' coat... very effective too. Really cute, and a fun idea. She's Got it Wired; Family, Motherhood & Career.